Outreach to individuals and organizations with an interest in providing support to Veterans and Families. Provide supportive assistance to those seeking to establish community-based events/activities designed to create community around Veterans and their Families. Below are some examples of how we create community around our Veterans in what we call the Veteran Community Action Network (VCAN). This is a network of volunteers taking on our mission and focus areas and doing great things in their community. You need not be a Veteran to make a difference. A series of events for our homeless Veterans to help them stay warm, connected and to provide toys for their kids. This is a movement seeking to fill a void within communities across our nation. The number of Veterans and their families on the streets every night is staggering and growing with every passing day. The exciting part of this movement is that it allows the entire community to be a part of it. You don't have to be a Veteran to make a difference. In direct support of the homeless Veterans at the VA facilities and other local shelters we offer a full evening of holiday music, dinner and fun. Your support via time, connections and donations will allow us to continue to do this kind of work. Click here for Tacoma - Warriors Christmas Tale donation letter. We were contacted by the Army Wounded Warrior (AW2) program when the spouse of a wounded warrior asked for help with their home. Over a Friday and Saturday more than 50 man days were donated to the cause. We put in a new patio slab that enabled us to build a wheelchair ramp to get to the back yard. We dug a trench to put in electrical to the shed, installed security lights on it for the back yard as well as created a door and ramp to allow them to secure their riding lawn mower. On the front side we installed security lights on the front wheel chair ramp. Around the yard we removed unwanted trees and bushes, and removed the enormous amount of branches in the yard from the winter ice storm. We also started the process to move the well house as well as create a new circular driveway. Our sponsors for the event were Lowes & Home Depot for the materials, Wayne's Wonderful Stone Features as the General Contractor Team and Patriot's Landing for the lunches. Volunteers for this project where both civilian contractors and lots of Veterans. 10 or more Veterans were from the VA Hospital's program for Homeless Veterans. A dozen or more wounded warriors were from the Warrior Transition Battalion on JBLM. The real value of this project was the uplift and self-esteem boost it gave to our Veterans that were in service on this project. It showed them that they can be part of something bigger then themselves and that they are of value to their community. 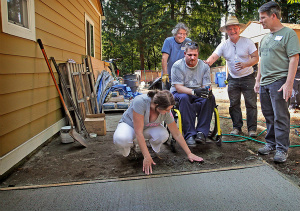 Partnering with Rebuilding Together - South Sound and the Master Builders Association, our Veterans helped to build 3 wheelchair ramps around Joint Base Lewis McChord and the local VA Hospital. The sites were chosen by Rebuilding Together to keep low income families in their homes. 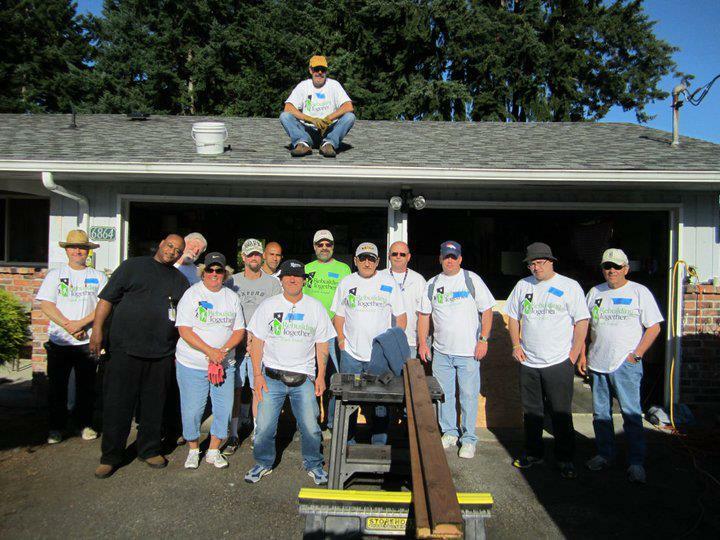 Volunteers for this project were mainly Homeless Veterans from the American Lake VA Hospital as well as the Tacoma Rescue Mission. Comments from one Vietnam era homeless Veteran after the project was "I've been just hanging out and now I'm proud again to say that I'm a Veteran!". His job was to mow the lawn and clean the gutters. We stand ready to partner with builder/painter organizations to create Veteran work parties that will give our Veterans the opportunity to be in service again and recognize that they are of value to their community and nation. Since 2010 we have been handing out Welcome Home boxes to our Veterans showing the appreciation of a grateful naation. Your support via time, connections and donations will allow us to continue to help our nation show its appreciation for our Veterans. 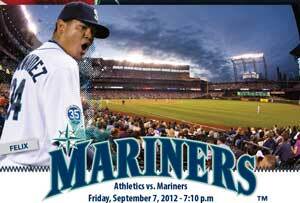 The 2012 event was the 1st ever Veteran Appreciation @ the Mariners which created a Veteran Resource Bazaar that brought nearly 20 different service provider organizations to our Veterans at the ball game. Over 200 tickets were donated to the Veterans at the JBLM WTB as well as the Homeless Veterans at the American Lake VA Hospital. Each year we set the intention to make the largest Veteran Appreciation Event west of the Mississippi. This is a collaboration with Veteran / Military friendly organizations in the state to honor Veterans from the entire northwest. This 2013 and 2014 event were the first official event at the Tacoma Rainiers as a joint venture to honor our Veterans and their families. It had the largest tail gate event ever seen and was a merger of elements from our 2012 Operation Fun.